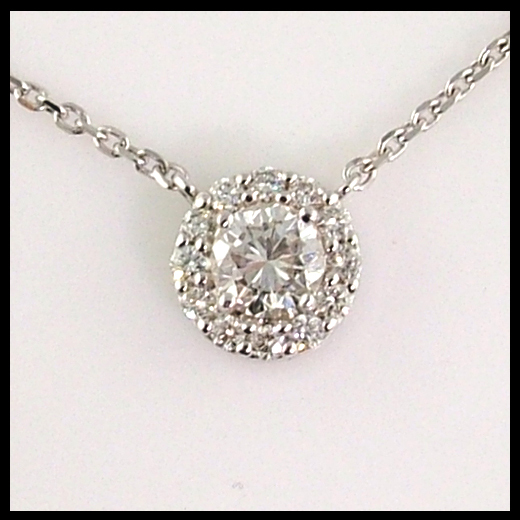 A custom diamond halo can make your diamond appear larger. Maybe you’ve already upgraded your original engagement ring with a bigger diamond. Or perhaps you’ve recently inherited grandma’s vintage wedding ring, complete with an itty bitty, but oh-so-meaningful diamond. So, what to do with that smaller, yet dear to your heart symbol of love? Surround it with a custom diamond halo! Whether you keep it in a ring, or even restyle it into a custom diamond pendant, adding a halo of small diamonds will make it not only appear bigger, but make it sparkle even more. The secret is in the custom design. 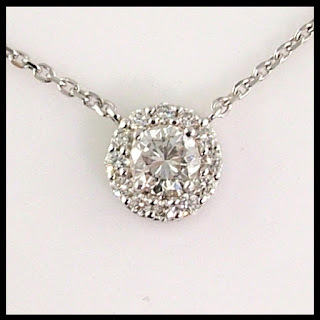 Dana had her original center diamond laying loose in her jewelry box. She decided to make it into a custom necklace because she wanted to wear it everyday, close to her heart. The design is simple, yet stunning. And she can also wear it with other longer necklaces, which is very hip. Scott has other tricks up his sleeve too, when it comes to diamond halos. He can even change the shape of the diamond – say into a princess cut stone from a round diamond. More on that later! Stop in and see what Scott’s Custom Jewelers can do for your jewelry!